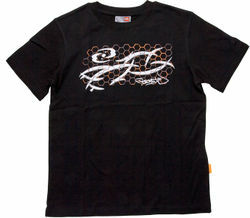 852494 BIONICLE T-shirt is a BIONICLE T-Shirt released in 2009. This is a description taken from LEGO.com. Please do not modify it. (see an archive of the product's page) A shirt fit for a BIONICLE® hero! Join the mighty Glatorian with this black BIONICLE T-shirt! Available in Youth sizes 5/6, 7/8 and 9/10. Available in Youth sizes 5/6, 7/8 and 9/10. Facts about "852494 BIONICLE T-shirt"
ShopDescription A shirt fit for a BIONICLE® hero!